Last month we decided to take the boys to hear a friend's band play bluegrass music at a local brewery. I had been to a flea market the day before and found a bunch of inexpensive games, so I brought them along to keep the boys busy. I figured the more busy they were, the longer we would get to stay. One of the things I picked up at the flea market (for $1.50) was this stacking cups set. It came with a mat and timer, as well as a dvd to show the sequence. I spent the next three days refereeing fights between the three boys, who all wanted to use it at the same time. They time themselves and started a wipe erase board with their personal records. At the brewery, every kid in the place gravitated over to check out the stacking cups. The boys were good about sharing with the other kids, and teaching them how to do the stacking sequence. We also brought Blockus and Qbitz. both of these are thinking games. The boys were really content to do these activities and listen to bluegrass. It was a successful evening, and I know next time I'll be bringing our bag of games! Readers, do you have a favorite board game? Excellent, Lisa! 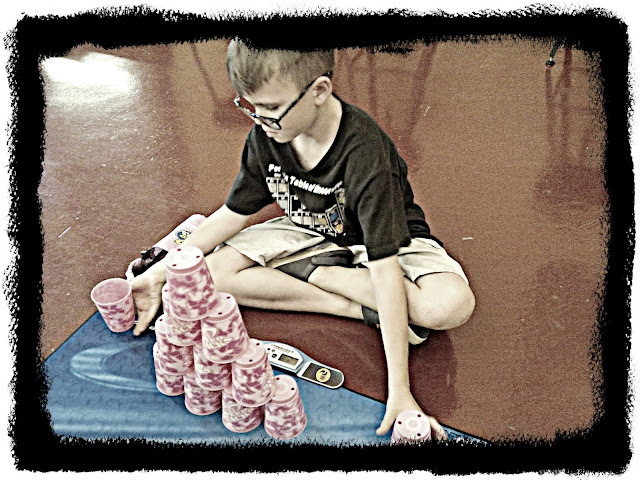 I'd not heard about the stacking cups; such concentration! 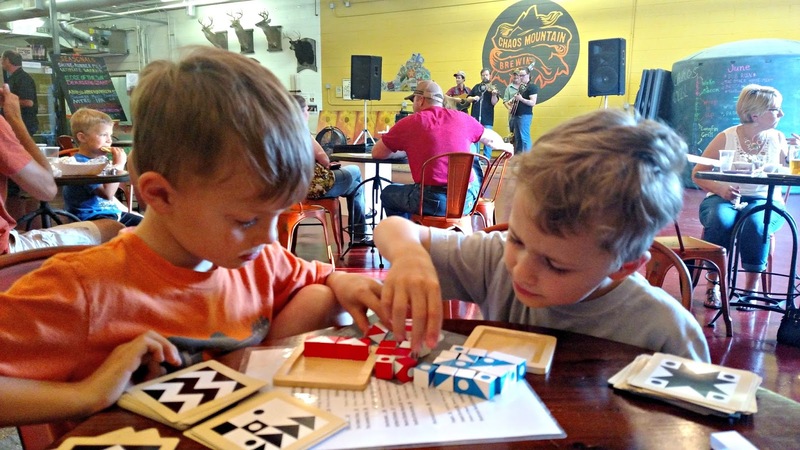 The kids liked playing games at the Callaway brewery, these small breweries are have more of a family atmosphere than a bar. At least the ones I have been to around here, haven't been anywhere else though. If I had a brewery, I would put games out and maybe even a fenced in playground, a McBrewery I guess. Hope you enjoyed the Bluegrass Concert. I like Scrabble and Rummikub. What an awesome idea you had to bring the games.! I have never heard of this stacking game, it should be advertised for sure. I would have to say my all-time favorite board game is Scrabble. I play it on line now on Facebook with friends. Along with Words With Friends and other word games. There must be at least 20 breweries around here, and new ones opening all the time. Hops growing everywhere. I have several posts to do on them. I went around taking pictures of them all, but it soon got too much, as it was neverending. Always so nice to see you and the boys! Goodness the best of both worlds! I'm a fan of those thinking games, and it seems there's always a new one to get, but it really holds the kid's attention and even adults. They're fun to put out on the dinner table when we have big gatherings! Here we get competitive with Monopoly in the winter. I like that stacking game. Haven't seen one of those before. Glad they were so well behaved. I didn't realize kids were allowed in a brewery. When my kids were very young I loved packing a backpack full of puzzles and games and wordsearch and even army men/animals and it kept them entertained as we traveled or visited, etc. We still love the game of Sorry! and Pictionary. My kids also LOVED the I SPY books... I bet you're already aware of them and knowing how inquisitive your boys are, they probably loved them too. We have a ton of favorite board games. My son's is Monopoly right now, and oy! it's fun but so long. ;) Glad you had a good time listening to the music. I have never tried stacking cups before! interesting..
Those all look like good games to busy their minds and hands. We always loved Apples to Apples and Uno. I enjoy playing games with my family. I love bluegrass music but steer myself away from it. My father was a big fan of bluegrass and it was even played at his funeral. Brings back both good and bad memories. Ah, your new header looks good! Sidebars are fixed... yay! What a great idea bringing the games along. We definitely enjoy Scrabble and also Aggravation.